When producing custom wallpaper installations for our clients, our end result is always to dramatically change the feel of a space, as well as how viewers respond to the mural within that space. With scenic or environmental imagery, we're essentially trying to transport the viewer to another place and maybe time. In a sense, we're attempting to alter the reality of the viewer with a wall mural: though they may be in a New York townhouse, a mural of a Southwestern landscape will be the strongest, most salient aspect of the room, thereby giving the notion that one is out of time and place. We couldn't think of a more clever way to fully transport oneself while still being 100% legal. To take a transportative scenic a step further, we've sometimes flipped the horizon on more static images. 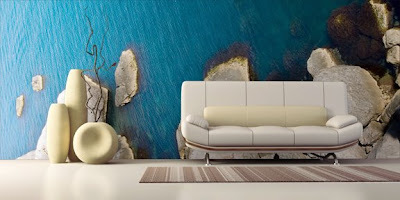 For example, the inspiration room features a custom wallpaper installation of a rocky coastline, punctuated by deep blue water. The image has been flipped on it's side, and though the effect may not be instantly recognizable, subtle lighting cues and the rippling water pattern gives the impression that something is somehow askew. This innocent attempt to confound the senses is just one of may tricks you can use in creating your own custom wall mural.